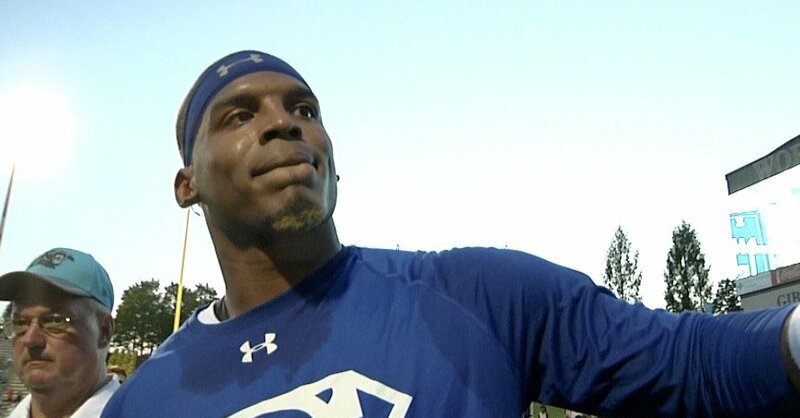 The Panthers opened up training camp Thursday evening and star QB Cam Newton pulled a “new year, new me”. Cam showed up to camp with a new look…an ombre goatee with blonde tips. Cam Newton is the type of player who is always entertaining. Whether he’s playing football, hanging out with a group of youngsters, or sitting at a podium for a press conference, Newton knows how to get people talking. On Friday, he did just that when he showed up for his presser wearing some unusual attire. Not only did he have on a massive hat, but his goatee was bleached. It’s like the facial hair version of Odell Beckham Jr.
Newton spoke on the Panthers’ explosiveness and team entering 2016 as he welcomes back stud wideout Kelvin Benjamin. The Panthers reached the Super Bowl and won 15 games without Benjamin in the fold last season. They’ll likely take a step back on defense given the departure of Josh Norman, but the offense will be even better in 2016.